Not from concentrate, no preservatives, no artificial or natural colouring or flavour additives and, no added sugar. We squeeze the pomegranates with the skin - where the most nutrients are extracted - creating that natural, unique taste - sweet with a bitterish touch. All packaged in the most natural and environmentally friendly manner – in high quality glass bottles. Offering the best products - products we truly believe in, while delivering them as natural as possible...as least processed as possible. Scientists in Israel have shown that drinking a daily glass of the fruit's juice can reduce the risk of cardiovascular disease. 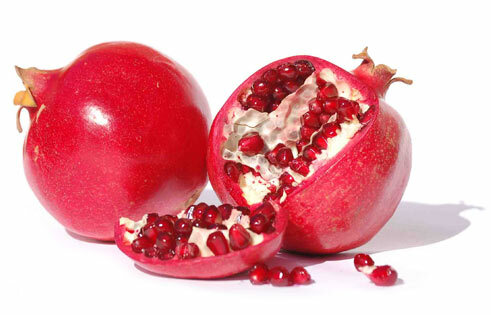 "Pomegranate juice contains the highest antioxidant capacity compared to other juices, red wine and green tea," said Professor Michael Aviram, who led the team. Science Daily — St. Louis, June 28, 2005 -- Expectant mothers at risk of premature birth may want to consider drinking pomegranate juice to help their babies resist brain injuries from low oxygen and reduced blood flow, a new mouse study from Washington University School of Medicine in St. Louis suggests.